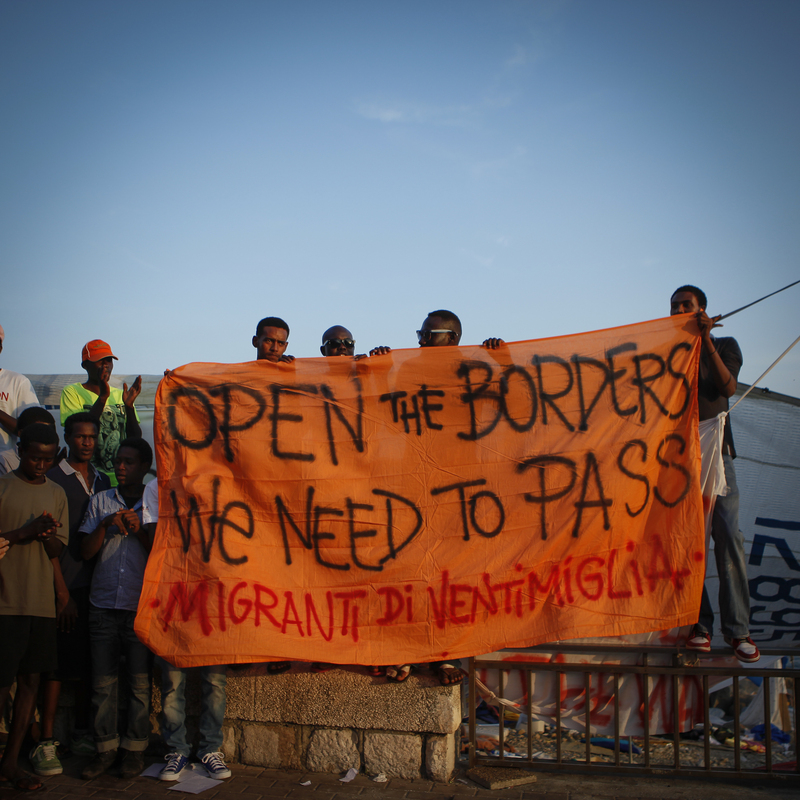 "No Borders" demonstration in Vintimille / ventimiglia by refugees asking for the re-instated French border to be re-opened. Words by Lewis Bush. Originally published on Disphotic. The dream of a united Europe and the free travel it allowed was in no small part born of the continent’s long history of intolerance and division. 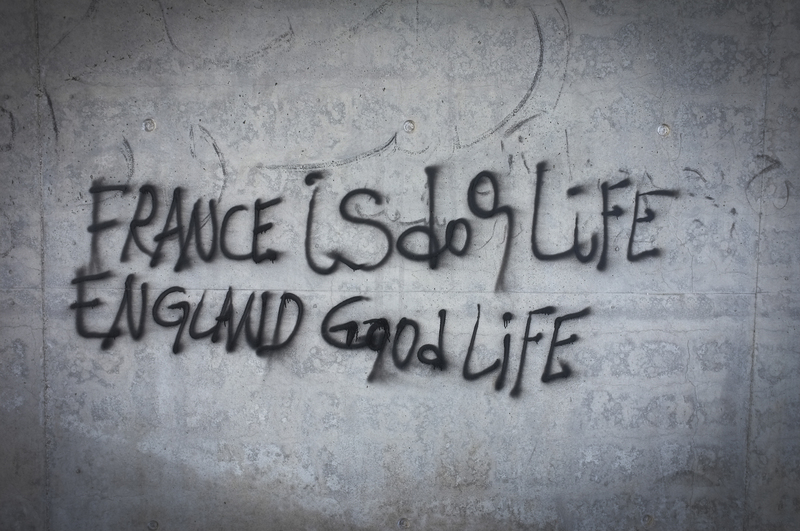 It came from the destruction and division of the Second World War, six years when human rights in Europe were trampled underfoot, and the continent was made anew as Fortress Europe, a continent ringed by the concrete and barbed wire of the Atlantic wall. It came also from the division between communist East and capitalist West that followed the end of the war, again was symbolised most pertinently by a physical border of concrete and steel. Not a wall built to keep people out of the East, but one uniquely designed to keep people trapped within it. Schengen was signed in 1985 even as the Berlin wall still stood, but it was a gesture of hope, a foreshadowing of the wall’s destruction four years later, and the treaty’s implementation in 1995 at last saw the creation at last of a single space within the borders of a long disunited continent. Flash forward, past the collapse of the Soviet system and through the fires of German reunification, and division is returning to Europe. This time though what Europeans fear are not massing foreign armies or an aggressive ideology, but ordinary people, forced into exodus by extraordinary circumstances like wars, and revolutions – some of them indeed catalysed by ill considered European interventions in distant lands – or sometimes just by the hope of a better life. The way each country responds to outsiders is different, a product of its unique culture and history. Slovakia for example announced it would only take in Christians wishing to settle in the country. Meanwhile in Germany one group has attempted to recall the broadly positive perception of those who fled East Germany, with campaigns calling on Germans to pick up refugees at the roadside and help them cross the border. It says much about Germany’s history that many of it’s people and politicians can are able to understand migration as a humanitarian or political act, not simply an economic one. By contrast, and in spite of the reputation of the British as a nation that offers safe haven, and of the British as a people who believe in fairness and playing by the rules, we have consistently refused to be fair with the people seeking to travel here. Rather than allowing them to reach the United Kingdom and seek asylum through the proper processes, our response to those who seek safety here is an ever more complex panoply of fences, barriers and security, intended to keep them languishing indefinitely on the outskirts of Calais. The United Kingdom, once a country regarded for its openness to foreigners, has systematically remade itself as Fortress Britain. In defence of these arrangements the Prime Minister David Cameron has argued that we must at all costs stop these ‘swarms’ of people intent on illegally breaking into the United Kingdom. Given the security arrangements in place, those people desperately wanting to settle in the United Kingdom have little other choice. 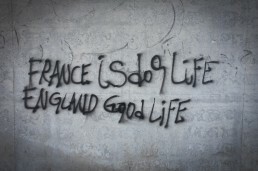 Those few who make it across the channel face two grim realities: Either a lifetime of living in the shadows of the United Kingdom’s black economy, vulnerable to human slavery, trafficking and exploitation. Or else a future of indefinite detention without trial in one of the country’s network of detention facilities, prisons in all but name. Places like the deceptively named Yarl’s Wood, operated for profit by the private security company Serco, and recently condemned by the chief inspector of prisons. What we need is not to seal refugees and migrants away behind barriers and fences, to ignore them and hope they give up and go away. Faced with few alternatives, not many will, and in the meantime many more will come. What we need is a more mature discourse about migration and the people forced to undertake it. We need to hear the stories and experiences of these people themselves, stories which are notably absent in the press. Those traveling from Africa, the Middle East and beyond need to be humanised and visualised as a matter of urgency, their stories and experiences used to combat uninformed prejudices and ignorance. The recent appearance of an Instagram account which appeared to belong to a young Senegalese man making the dangerous journey across the Mediterranean Sea, and the surge of public interest paid to it before it was unmasked as fake, shows that people are genuinely interested in hearing these stories. To tell these stories is part of the purpose of Phil le Gal’s The New Continent, a project featuring people caught on either side of Europe’s borders and offering a platform for them to describe their experiences, hopes and fears. People like Sadik from Sudan, a medical student who fleeing conflict was interned for months in Libya before making the dangerous Mediterranean crossing. Or Ahmed and Ikbal, two teenagers who became friends during their journey from Afghanistan and now look out for each other in The Jungle, the sprawling informal settlement on the outskirts of Calais. These are not ‘swarms’ or ‘marauders’, not abstract embodiments of a political or economic problem. They are human beings, people, in the position they are now because of the lottery of birth and the game of geopolitics. Fortifying our country and our continent only exacerbates their plight, by pushing a burden that we are in a rare position to shoulder on to other states in Europe less able to do so, and who lie closer to the key entry points into the continent. These states perhaps understandably follow our pathetic example, avoiding the burden of supporting those fleeing war and turmoil by trying to prevent them from crossing borders at all, or else funneling them as rapidly as possible into neighboring countries. The result is that Europe is witnessing an arms race of fence building and a militarisation of borders as states across the continent respond to the crisis not by increasing provision for displaced people, but by spending vast amounts to ensure that they cannot access provision at all. These fences and barriers are spreading across Europe, from one country to another like a regressive ripple, a new iron curtain of steel chainlink and razor wire. France has reinstated its border controls with Italy in an attempt to curb migration, and Hungary has recently completed the construction of a new $35 million fence along its border with Serbia. Reflecting the strange nature of these solutions, this fence is reported to end suddenly in the middle of a field, at the tri-point where the Hungarian, Serbian and Romanian borders meet. Other countries seem likely to follow the example, Macedonian police have struggled to prevent large numbers of Syrian refugees from crossing into the country from Greece, employing batons and stun grenades, while Bulgaria has mobilised military units near the Macedonian border and is extending its border fence with Turkey. In counterpoint to the dream, Europe is degenerating into something which increasingly resembles the darkest days of it’s history. It is becoming a contradictory land of fences and gates, armed guards and checkpoints, a union in name but a patchwork in practice. A place where by a twist of birth some are left free to travel without care, while others languish for months in the hinterlands of port cities and border zones, waiting for a chance to slip through. 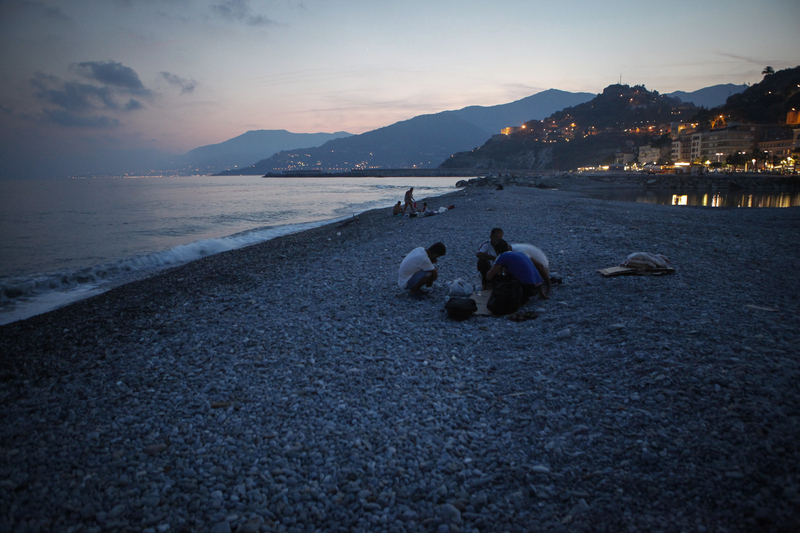 Iranian refugees are breaking their fast during Ramadan on the beach in Ventimiglia, Italy. In the distance is France. July 2015.